Fall/Winter 2010 Imperial Fashion Trend. 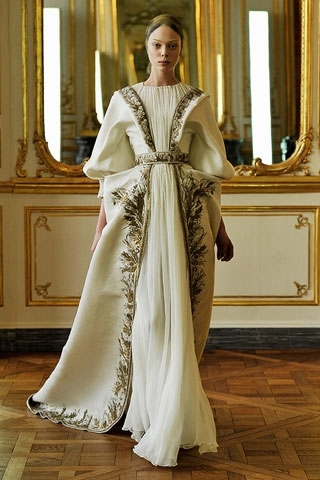 Fashion designers seem to have found their muse in royal fashion as well so take a peek at the new imperial fashion trend as it exudes elegance and style! The new fashion trends featured on the 2010 fall/winter fashion presentations look fabulous and have a certain “je ne sais quoi” attached as they are a magnet of attention due to their style. The style of the collections presented this season vary widely allowing diversity to be dominant, thus permitting women to be more selective when it comes to the right fashion style for them. One of the styles that attracts a great amount of attention this season is the fall/winter 2010 imperial fashion trend, a new fashion trend which suit women who exude femininity, elegance and style. The fabrics which help create the fabulous imperial style outfits play a very important role in their appearance, thus luxurious fabrics have been used, fabrics such as velvet, silk and embroiled fabrics which have a certain soft and elegant feel and look. The outfits created vary from modern to vintage, allowing women to select the outfit which suits their personality and occasion best. From fabulous royal inspired dresses to interesting, futuristic inspired dresses and casual chic items, the imperial style outfits exude an equal amount of style and elegance so select the one that suits you best. Dresses have always been highly popular when it comes to formal occasions and not only and these imperial style dresses can make you stand out through your elegance at different formal events. Whether simple of adorned with sophisticated glittery insertions, these dresses look lovely and the styles suit different body types and occasions. Flared sleeves seem to be hot and popular when it comes to this fashion style, but classic cut sleeves are equally as popular as not everyone can benefit from the flared sleeves style. The accessories used when it comes to this fashion style are usually minimal as the embroidery and sophisticated insertions attract sufficient attention and don't require going bold with accessories. Turn towards simple belts, hair accessories and the right shoe style. You can choose from pumps to over the knee boots, depending on the selected outfit. Pay attention to details as this imperial fashion style is royalty inspired so elegance and well thought details are a must if you wish to look fabulous. Inspire yourself from the incredible fashion collections signed Alexander McQueen, Balmain, Andrew GN, Viktor & Rolf, Rochas, as they truly fabulous and inspirational.